Prince Phillip: [Hearing Aurora's singing] You hear that, Samson? Beautiful. Prince Phillip: What is it? Come on, let's find out. Prince Phillip: I'm awfully sorry. I didn't mean to frighten you. Prince Phillip: But don't you remember? We've met before. Princess Aurora: We... we have? Prince Phillip: But of course! You said so yourself. Once upon a dream. Merryweather: [referring to the dress] It's pink! Flora: Oh, lovely shade, isn't it? Merryweather: But I wanted it blue. Flora: Now, dear, we decided pink was her color! Fauna: Now, yeast, one tsp. Tsp? Fauna: One teaspoon, of course! Maleficent: ...oh, how quaint - even the rabble. Chorus: [singing] For true love conquers all! Maleficent: Oh come now Prince Phillip. Why so melancholy? A wondrous future lies before you - you, the destined hero of a charming fairy tale come true. Behold - King Stefan's castle. And in yonder topmost tower, dreaming of her true love, the Princess Aurora. But see the gracious whim of fate - why, 'tis the self-same peasant maid, who won the heart of our noble prince but yesterday. She is indeed, most wondrous fair. Gold of sunshine in her hair, lips that shame the red red rose. In ageless sleep, she finds repose. The years roll by, but a hundred years to a steadfast heart, are but a day. And now, the gates of a dungeon part, and our prince is free to go his way. Off he rides, on his noble steed, a valiant figure, straight and tall! To wake his love, with love's first kiss. And prove that "true love" conquers all! Narrator: But King Stefan, still fearful of his daughter's life, did then and there decree that every spinning wheel in the kingdom should on that very day be burned, and so 'twas done. Maleficent: It's incredible! Sixteen years and not a trace of her! She couldn't have vanished into thin air. Maleficent: Are you sure you searched everywhere? Maleficent's goon: Yep, yep, everywhere. We all did. Maleficent: And what about the town? The forests? The mountains? Maleficent's goon: Yeah, we searched mountains and forests and, uh, houses and... uh, lemme see here... and all the cradles. Maleficent: Cradle? Maleficent's goon: Yep, yep, every cradle. Maleficent: Did you hear that, my pet? All these years, they've been looking for a baby. King Hubert: Nowadays I'm still the king! And I command you to come to your senses! Prince Phillip: [riding off] Goodbye, father! King Hubert: Goodbye, father. Marry the girl you... No, no! No, no, Phillip! Stop! Come back! Flora: Wait, Prince Phillip. The road to true love may be barred by still many more dangers, which you alone will have to face. So arm thyself with this enchanted Shield of Virtue, and this mighty Sword of Truth, for these weapons of righteousness will triumph over evil. Now come, we must hurry. King Hubert: Well, what do you think? Nothing elaborate, of course. Forty bedrooms, dining hall... honeymoon cottage, really. King Stefan: You - you mean you're building it already? King Hubert: Built, man! Finished! Lovebirds can move in tomorrow. King Stefan: Tomorrow? But Hubert, they're not even married yet. King Hubert: Ha ha, we'll take care of that tonight. To the wedding! King Stefan: Now, hold on, Hubert. I haven't even seen my daughter yet, and you're taking her away from me? King Hubert: Getting my Phillip, aren't you? King Hubert: Want to see our grandchildren, don't we? King Hubert: Well, there's no time to lose. Getting on in years, ha ha ha. To the wedding! Princess Aurora: Well, I'm really not supposed to speak to strangers, but we've met before. Merryweather: She's got Prince Phillip! Flora: At the Forbidden Mountain. Fauna: But we can't, we can't go there! Flora: We can, and we must! Fauna: Poor King Stefan, and the Queen. Merryweather: They'll be heartbroken when they find out. Flora: They're not going to. Flora: We'll put them all to sleep, until Rose awakens. Flora: I'll turn her into a flower. Fauna: Oh, she'd make a lovely flower. Flora: Don't you see? A flower can't prick its finger. Merryweather: It hasn't any. Flora: She'll be perfectly safe. Flora: [laughs, then stops abruptly] Yes... oh dear. Fauna: She always ruins your nicest flowers. Flora: [to Aurora, seating her before a mirror] Now dear, if you'll just sit here. This one last gift, dear child, for thee. Flora: The symbol of thy royalty. A crown to wear in grace and beauty; as is thy right, and royal duty. Merryweather: It's that boy she met. Fauna: Whatever are we going to do? Merryweather: [irked] Ooh, I don't see why she has to marry any old... prince! Fauna: Now, that's not for us to decide, dear. Fauna: [to Flora] Maybe we should tell King Stefan about the boy. Merryweather: Well why don't we? Flora: [listening at the door] Listen!... Maleficent! Rose! Fauna: Oh why did we leave her alone? Rose! Merryweather: What does she want here? Maleficent: Well, quite a glittering assemblage, King Stefan. Royalty, nobility, the gentry, and-- [chuckles and looks at the Good Fairies] How quaint! Even the Rabble. [Merryweather charges at her but is held back by Flora] I really felt quite distressed at not receiving an invitation. Maleficent: Not wa--Oh, dear, what an awkward situation. I had hoped it was merely due to some oversight. Well, in that event, I'd best be on my way. Queen: And you're not offended, Your Excellency? Maleficent: Why, no, Your Majesty. And to show I bear no ill will, I, too, shall bestow a gift on the child. Listen well, all of you! The princess shall indeed grow in grace and beauty, beloved by all who know her. But… before the sun sets on her sixteenth birthday, she shall prick her finger on the spindle of a spinning wheel...and DIE! Queen: [grabs Aurora] Oh, no! Maleficent: Stand back, you fools! Flora: Shh! No time to explain. [they magically break his chains and he gets up to leave] Wait, Prince Philip. The road to true love may be barred by still many more dangers, which you alone will have to face. So arm thyself with this enchanted shield of virtue, and this mighty sword of truth, for these weapons of righteousness will triumph over evil. Now come, we must hurry. Maleficent: [off-screen, coaxing Aurora into pricking her finger] Touch the spindle. Touch it, I say! Princess Aurora: [on her return from picking berries] Aunt Flora? Fauna? Merrywether? Princess Aurora: Where is everybody? Princess Aurora: [gasps as she sees her new dress draped over a chair and rushes toward it eagerly] Oh! King Hubert: [fighting with Stefan] I'm not so sure my grandchildren want you for a grandfather! Fauna: Well, what do you think of it? Flora: Why, it... it's a very unusual cake, isn't it? Fauna: Yes... of course, it will be much stiffer after it's baked. Flora: Oh, I improved it. But perhaps if I added a few more ruffles... eh, what do you think? Fauna: Um, I think so. What do you think, Merryweather? Merryweather: I think we've had enough of this nonsense! I think we ought to think of Rose, and what she'll think of this mess! Merryweather: And I still think what I thunk before: I'm going to get those wands. Fauna: You know, I think she's right. King Hubert: To the wedding! King Stefan: Now, be reasonable, Hubert. After all, Aurora knows nothing about all this. King Stefan: Well, it may come as quite a shock. King Hubert: [Spits out his wine] Shock? My Phillip a shock? What's wrong with my Phillip? King Stefan: Nothing, Hubert. I only meant... King Hubert: Why doesn't your daughter like my son? King Stefan: Now, now... King Hubert: I'm not so sure my son likes your daughter! King Stefan: Now, see here... King Hubert: I'm not so sure my grandchildren want you for a grandfather! King Stefan: Why you, you, unreasonable, pompous, blustering old windbag! King Hubert: Unreasonable, pompous... En garde, sir! [Reaches for his sword, but grabs a fish by mistake] King Stefan: I warn you, Hubert. This means war! King Hubert: [Fighting] Forward! For honor! For country! For... [Realizes he's fighting with a fish; they both start laughing] King Hubert: What's this all about, anyway? King Stefan: Nothing, Hubert. Absolutely nothing. King Hubert: Those children are bound to fall in love with each other! King Stefan: Precisely. And as for grandchildren, I'll have the royal woodcarvers start work on the cradle tomorrow. King Hubert: Splendid! King-sized, of course. King Stefan: Certainly! To the Woodcarvers' Guild! Princess Aurora: Oh, dear. Why do they still treat me like a child? Princess Aurora: Aunt Flora, and Fauna, and Merryweather. They never want me to meet anyone. Princess Aurora: But you know something? I fooled them. I have met someone. Owl: Who? Who? Princess Aurora: Oh, a prince. Princess Aurora: Well, he's tall and handsome, and... and so romantic. Princess Aurora: Oh, we walk together, and talk together, and just before we say goodbye, he takes me in his arms, and then... I wake up. Princess Aurora: Yes, it's only in my dreams. But they say if you dream a thing more than once, it's sure to come true, and I've seen him so many times. Prince Phillip: But when will I see you again? Princess Aurora: Oh no, this evening! Princess Aurora: [calling back while running away] At the cottage... in the glen. Flora: Thou sword of truth, fly swift and sure, that evil die and good endure! Maleficent: Listen well, all of you. Maleficent: The princess shall indeed grow in grace and beauty, beloved by all who know her. But... before the sun sets on her 16th birthday, she shall prick her finger, on the spindle of a spinning wheel - AND DIE! Queen: [clutching Aurora] Oh no! King Stefan: Seize that creature! Flora: Don't despair, your Majesties. Merryweather still has her gift to give. King Stefan: Then, she can undo this fearful curse? Flora: Maleficent's powers are far too great. Fauna: But she can help. Merryweather: I'd like to turn her into a fat ol' - hop toad. Merryweather: Well, that would make me happy. Maleficent: No! It cannot be! Maleficent: Now, shall you deal with ME, O Prince - and all the powers of HELL! Maleficent: [seeing captured Prince Philip] Well - this is a pleasant surprise. I set my trap for a peasant and LO! - I catch a prince! Away with him - but gently my pets, gently. I have plans for our royal guest. Flora: Good gracious! Who left the mop running? Fauna: She's in love of the...! Princess Aurora: Why? After all, I am sixteen. Flora: It isn't that, dear. Fauna: You're already betrothed. Merryweather: Since the day you were born. Fauna: To Prince Phillip, dear. Merryweather: A princess. Fauna: And you are, dear. 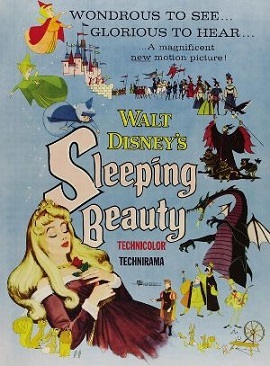 Flora: Princess Aurora. Tonight we're taking you back to your father, King Stefan. Princess Aurora: But... but I can't! He's coming here tonight. I promised to meet him. Flora: I'm sorry, child. But you must never see that young man again. Princess Aurora: Oh no. No! I can't believe it, no! No! Flora: [Fauna cries at Aurora's and Phillip's wedding] Why Fauna, what's the matter, dear? Fauna: Oh... I just love happy endings. Maleficent: [alone with her pet again] Oh, they're hopeless. A disgrace to the forces of evil. Maleficent: My pet... you are my last hope. Circle far and wide... search for a maid of sixteen with hair of sunshine gold and lips red as the rose. Go, and do not fail me. Maleficent: Touch the spindle. Touch it I say! Maleficent: You poor, simple fools. Thinking you could defeat me. Me! The mistress of all evil! Well, here's your precious princess! King Hubert: Stefan, there's - there's something important I have to tell you. King Stefan: Eh, but not now, Hubert. King Hubert: But, but it's uh, about Phillip. King Stefan: Phillip? Oh, yes, of course, Phillip. Why, where is the boy? King Hubert: That's what I'm trying to tell you. King Stefan: Well, send for him immediately! Herald: The sun has set! Make ready to welcome your princess! Merryweather: But, I never baked a fancy cake. Flora: Oh, you won't have to, dear! Fauna: I'm going to bake the cake! Merryweather: You? Flora: Oh, she's always wanted to, dear, and this is her last chance. Fauna: I'm going to make it 15 layers with pink and blue forget-me-nots. Fauna: And I'm making the dress. Merryweather: But you can't sew! And she's never cooked! Fauna: All you do is follow the book! Flora: [putting Merryweather on a stool] Up here, dear. You can be the dummy. Merryweather: Well, I still say we oughta use magic.